When Thou, O Lord, wast baptized in the Jordan,/ the worship of the Trinity was made manifest;/ for, the voice of the Father bare witness unto Thee,/ calling Thee His beloved Son;/ and the Spirit in the form of a dove/ confirmed the certainty of His word./ O Christ our God, Who hast appeared and enlightened the worlds,// glory be to Thee! Saturday, 19th January 2019, on the Feast of the Theophany, or Baptism of our Lord, God and Saviour Jesus Christ, the church-goers of the Metropolitan Cathedral in Chisinau, gathered in prayer to participate in the Divine Service celebrated by Metropolitan Vladimir of Chisinau and Moldova. After the Divine Liturgy, the Service of the Blessing of the Waters, or the Great Agiasma, was officiated by metropolitan Vladimir, who was assisted in prayer by the Cathedral clergy. Present at the Divine Service was President of the country, Mr. Igor Dodon. 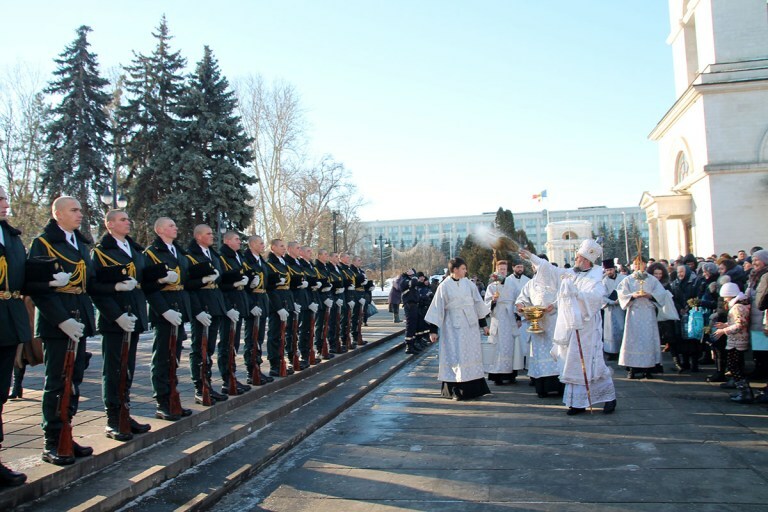 Traditionally, soldiers of the National Army participated in the Blessing of the Waters service, making several shots into the air, symbolizing the thunder-like voice of God-Father Who witnessed onto our Lord Jesus Christ during His Baptism.